It’s no secret that Ghana offers some pretty spectacular beaches in on the continent. For anyone wanting to escape the city and find solace in the coastal suburbs and ocean views, there are endless options. From luxury resorts to camping sites, there’s something to suit everyone’s holiday style. NEWS-ONE, therefore, brings to visitors some of the best and brilliant beaches within the Greater Accra Region one can consider for the weekend getaway. This is part of an initiative by the office of the Ministry of Tourism Arts & Culture to attract tourists to the best destinations in Ghana. When the world around you is simply too chaotic, it’s easy to find yourself daydreaming about a beach getaway that’s free from stress and obligation. Sankofa Beach House is that premier destination you so desire. Located on the outskirts of Accra, the quiet clean beach is in Langma Village near Kokrobite Village and sits on almost four acres of beach front property with a large grass open space. It has been tagged as a place for creative happiness and wellness. Sankofa is a special place dedicated to bringing together people with big ideas who are committed to having a great time. The Beach House exudes an atmosphere that nurtures and cultivates opportunities to think deeply about one’s life experiences while discovering different ways to enjoy life alone or in a group. This is also one of the beautiful beaches out here. For your amazing beach walk and all the other beach relaxations you want, one of the best hangouts is the Bojo Beach. It is located west of Accra and very clean. On arrival, there’s a small entrance fee to pay, and you’ll then be rowed across a clear strip of water to a pristine strip of beach, where there are sun loungers and refreshments. If you want to stay the night, the Bojo Beach Resort has suitably Swiss rooms. Kokrorbite Beach is calm and nice atmosphere beach. Located off the Accra -Kasoa road, this beach line stretches as flat shoreline and also is well known as surf spot. It is always teeming with expats who come to enjoy the Rastafarian culture prominent there. It is great for a party, with many seats and a calm atmosphere because of the shade of the many palm trees on the shoreline. There are many hostels and lodges. Sandbox is a great one for all beach-lovers. Located at South Labadi Estate, it has a state-of-the-art beach resort that gives visitors so much fun, a romantic getaway and a breath-taking view of the Atlantic Ocean. For an amazing dance experience and letting loose the kinks, Sandbox is also visitors’ best bet for the weekend. 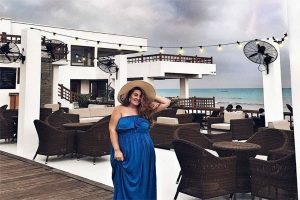 Also in Accra, the La Palm Royal Beach is firm favourite among travellers for its luxurious seafront and has been in operation for several years. By prioritising luxury and creating a premium, relaxing atmosphere, the La Palm Royal Beach is suited for holidaymakers craving pristine, disturbance-free time in Ghana. Cocoloco Beach is one of the best beach getaways in Ada about an hour drive from Accra, where the Volta River meets the Atlantic Ocean. The beach is an ideal getaway for those looking to experience a bit of the Ghanaian way of life. This small fishing village offers guests a quiet holiday amidst the beautiful waters of the beaches and swaying palm and coconut trees. As this is a beach resort, you can swim in the waters; tan under the sun; play beach volleyball or simply relax and enjoy the scenery. You can feel nature on the beach because the beach is a breeding ground for a variety of sea turtles and the sanctuary of estuarine birds. The Volta Estuary, where the Volta River meets with the Atlantic Ocean, is sanctuary for several birds. Cocoloco Beach is well known as camping spot and a number of bungalows built in a traditional style by backpackers. Many tourists visit there to relax on beautiful beach and atmosphere. This is equally great to visit at Ada, an hour drive from Accra for your weekend beach experience. It is close to the Volta Estuary and offers a beautiful natural environment. Visitors are expected to find a number of chalets and weekend guesthouses nearby. You can enjoy many beach activities around here. The resort and many organisations provide a number of beach activities such a jet ski, sailing, fishing, swimming, a trip to the estuary and so on. 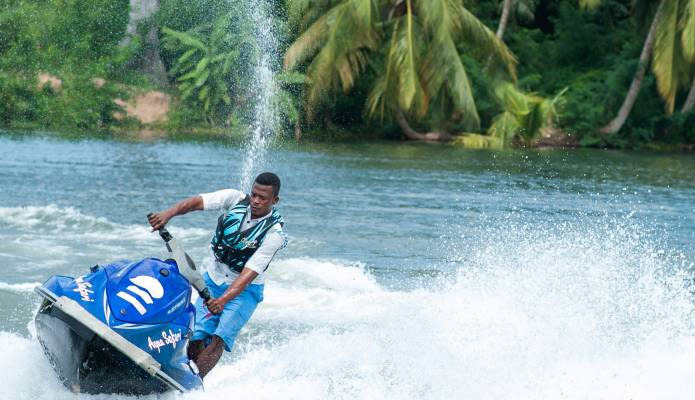 There is also Peace Holiday Resort located close by, with its jet skies and other water sports and game-fishing equipment available for hire. Aqua Safari is also one of the best destinations in Ada that provides visitors with an ultimate resort experience. It has led to transforming of breathtaking beachfront land into a potpourri of thrilling sensations. It offers scenic views and unforgettable experiences that you really won’t find anywhere else. From the architectural masterpieces to the lush evergreen lawns, integration of fascinating wildlife, clean beaches, vast array of adventure activities and natural sights, the Aqua Safari experience is fitting for your bucket list. Just an hour drive outside of Accra, Aqua Safari gives you the thrill of an escape and the proximity of a world-class resort.